This seaside villa is 7,000 square feet and is on 3.5 acres of land with gorgeous panoramic views. Between the pool, hot tub, two hammocks, and snorkeling equipment, there’s little reason to ever go inside. If you do, you’ll have plenty of space to relax amidst the large living room, seven bedrooms and baths, gourmet Miele kitchen, and fitness center. With all this luxury set against beautiful ocean vistas, any weary traveler can feel revived at Paradise Villa. Gated villa overlooking the Sea! Paradise Villa is a luxurious, gated vacation rental that combines natural beauty with quiet elegance while offering unrivaled views of the Caribbean Sea. The villa’s protected harbor with a boat dock and private beach are located directly in front of the main house. A long, multi-leveled lap pool stretches across the front of the deck with a wading area for kids and a deeper section for morning swims. There’s also a more private plunge pool tucked around the side of the house. Shaded and sun-warmed loungers line the stone-tiled deck, and everything faces the glorious ocean views. Blowing Point and St. Martin are visible on the horizon. A wide staircase leads to the upper terrace, where guests can dine al fresco or swing in hammocks under the veranda. There’s also a fully equipped gym on the side of the home with cardio equipment, weights, a scale, and a Bose sound system. The home has easy beach access, and an adjacent coral reef offers some of the best snorkeling in Anguilla. A pool keeper, maintenance technician, boatman, and gardener keep the villa in top shape. Guests also have signing privileges at The Reef by Cuisinart and can use the restaurant, bar, spa, and golf course. Upstairs, there’s a sprawling living room filled with McGuire furniture, a Bose Stereo system, a 42” Plasma TV, and a DVD player. It opens to two terraces, and an office area equipped with computer, printer, and private fax machine sits off to the side. The villa’s oversized galley kitchen with GE Monogram and Miele appliances and granite worktops shares this level with the living room. A dining room with seating for six rests between the kitchen and living room. There’s also an outdoor covered dining pavilion, each seating twelve, with ceiling fans and air-conditioning throughout. All seven bathrooms are fitted with custom made marble and granite countertops and feature accessories by Rolex, Kohler and Villeroy Boch. The air-conditioned bedrooms feature flatscreen TVs, DVD players, and stereo systems. Three are upstairs, three are downstairs, and one is in the studio. The upper level Master Suite has a king bed, private terrace, and an ensuite bathroom. There’s also a queen suite and a twin suite upstairs that share a bathroom. On the ground level, there’s a king suite and a queen suite with two beds. There’s also a lower level Master Suite with terrace access and a king bed. Each of these suites has a private bathroom. Take a five minute walk to Sandy Point Beach for great snorkeling in a coral reef protected lagoon. Blowing Point Ferry Terminal is a short drive away, and the Anguilla International Yacht Club is a short drive in the opposite direction. 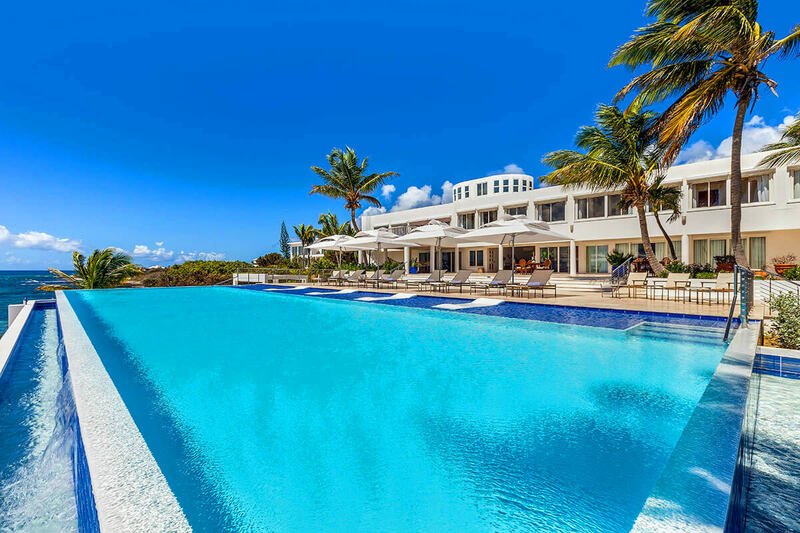 pool size 28 ft. x 69 ft., Infinity edge pool spilling over into the Caribbean Sea. Five minute walk to Sandy Point Beach. Daily continental breakfast and signing privileges at CuisinArt Golf Resort and Spa with a reservation for a day use room. Zodiac (small boat) with captain to take you beach hopping (on the St. Martin side of the island), snorkeling and lobster fishing (offered in high season only). Marketing Levy of $3 per person/per day for guests age 12 years and older paid at check-out. Car rental, private chef, butler, server, grocery and beverage shopping (pre-arrival and during your stay), liquor and wine delivery, nanny service, baby equipment, spa services, yoga and personal training, photography, and private airport transfer/car service can be arranged for an additional fee. Oliver and I had the perfect destination wedding at Villa Paradise. We had about 40 family members join us for our wedding week and each day we would all meet up at the villa to enjoy the pool, hot tub, hammocks and view. Everyone was taken back at its beauty and size. It was especially nice to have several bedrooms on the ground floor for the grandmothers and my mother who is handicap. The day of the wedding turned out beautiful after all the décor was completed. The villa provided the most amazing pictures with its manicured lawns and spectacular views. We both feel that we could not have picked a better place. The house staff was wonderful, kind, and helpful in so many ways. They accommodated us with cots, extra linens and a wheelchair. The villa was well kept and clean at all times. The only problem was the seaweed that turned the turquoise waters brown. This was not the villa’s fault, but it would have been nice to see those beautiful blues in our wedding pictures. We would recommend staying at Villa Paradise, you will have a lot of time to relax and will never want to leave!! Shawna was very helpful. She always made herself available to talk to. When we had requested for the boat replacement she took care of it before we arrived. We will work with her again for our next adventure. We will definitely return to Paradise… in more ways than one. We’ve had a terrific experience with Shawna and Andrew. They make the vacation planning process a breeze. We will book through them for next year as well, and probably the year after… and the one after that! Everybody enjoyed the villa, the amenities and the excellent team - Venetta and Earl taking care of us! Working with Shawna at WhereToStay.com was a great experience!